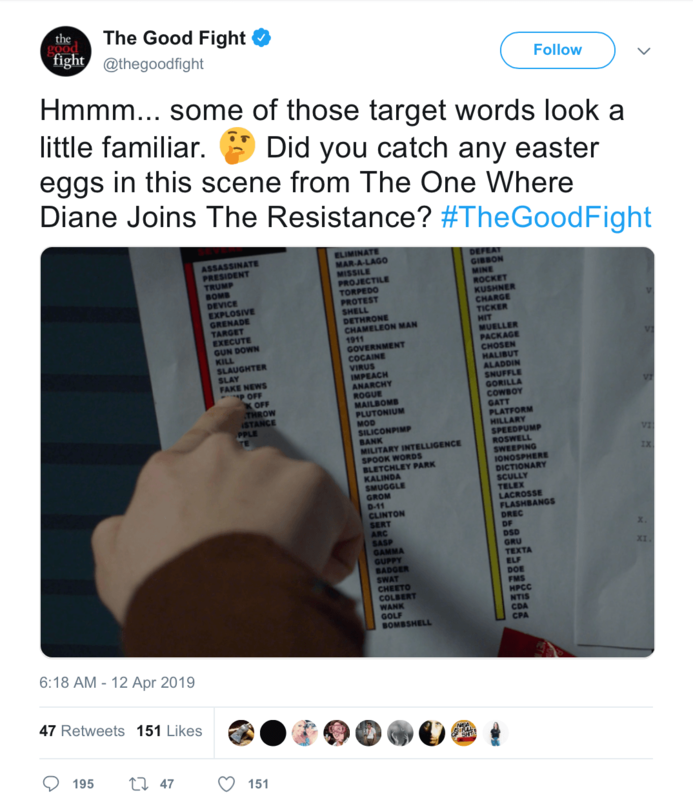 CBS crime drama The Good Fight tweeted an image on Friday from a recent episode, entitled, “The One Where Diane Joins the Resistance.” The imaged showed a character pointing to a list of “target words” that included the phrases “Assassinate President Trump” and “Eliminate Mara-A-Logo.” The tweet, which has since been deleted, sparked backlash among Twitter users, many of who reported CBS to the Secret Service. “Threatening the President of the United States is a federal felony under United States Code Title 18, Section 871. It consists of knowingly and willfully mailing or otherwise making “any threat to take the life of, to kidnap, or to inflict bodily harm upon the President” said one Twitter user in a reply to the CBS account.